The Nvidia GeForce 9800M GTS SLI consists out of two GeForce 9800M GTS in SLI mode. Each 9800M GTS is based on the G94 core with 64 shader processors. The chips are produced in 65nm (512 MB) and later in 55nm (1024 MB versions). Therefore, the boards power consumption stays the same (75 Watt) for both versions. The SLI version of the 9800M GTS is about 0-40% faster than a single 9800M GTS (depending on the SLI support of the game and the driver version). In some games there may even be a slight decrease of performance. Furthermore, some games may suffer from micro stuttering in the range of 30 fps (because of the different frametimes). This means you may need more fps for a fluent gameplay experience. Still DirectX 10 games should run in medium to high detail settings and resolutions. As all cards with DirectX 10 capabilities, the GeForce 9800M GTS renders the 3D images using "Unified Shaders". There don't exist any more dedicated pixel- and vertex shaders but 2x64 so called stream processors make the graphic work (which has been done by pixel and vertex shaders in former days). Furthermore, the shader units are higher clocked than the chip (1500 MHz). In conjunction with the Nvidia 9100M G integrated graphics, the 9800M GTS supports Hybrid-SLI (only HybridPower). HybridPower is a technique to choose between the integrated and dedicated graphics core, if performance or battery runtime is needed. This works only in Windows Vista. Up to now the user has to use a tool to switch between the GPUs. Later Nvidia wants to switch automatically in the drivers. 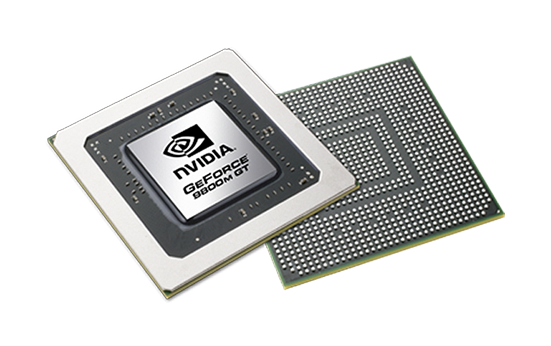 GeForceBoost is not supported with this card, as there would be no performance gain to combine the integrated GPU with the 9800M GTS. Compared to desktop graphics cards, the 9800M GTS SLI should be a bit slower than the GeForce 8800 GS in SLI mode(which has a higher memory clock rate).